#1 - When the Patrol was started in 1929 this patch was worn on shirts, but only for two years until 1931. The same design patch was worn on coats, but had a rounded shape. #2 - In 1931 the earlier design stayed the same but the background color of the patch was changed to orange. This shirt patch has been found in 4 slightly different issues. #3 - This coat patch was worn from the early 1940-s thru 1954. A similar patch was worn from 1931 to the early 1940-s, but was a longer patch, allowing for rank stripes to be added under the wheel and arrow design. #4 - In 1954 the patch saw a dramatic change in design. This patch was worn on shirts from 1954 to 1971. A larger version was worn on coats from 1960 until 1971. #5 - This variation of the 3rd issue shirt patch is believed to have been the first order of the 1954 design, since it is found in the same orange color as the earlier patch. #6 - This coat patch was worn from 1954 thru 1960. #7 - This shirt patch has been worn since 1971 and is the current uniform patch. A larger version is also worn on coats. #8 - This small Executive Security tab was only worn for a few years in the early 1970-s by Troopers who worked Governor-s Security. #9 - The orange PFC stripe was worn from the early 1940-s until 1954, the yellow PFC was worn from 1954 thru the early 1960-s.
#10 - Orange Corporal stripes were worn from 1931 until 1954, yellow Corporal stripes worn from 1954 thru 1968. #11 - These orange Technical Sergeant stripes were worn from 1951 until 1954 by the 3rd in command in each of the 5 Patrol Troops in the state. #12 - Yellow Technical Sergeant stripes were worn from 1954 thru 1970. #13 - Airwing Sergeant stripes were worn from 1962 to 1972, and only by 2 men. #14 - Line Sergeant stripes have been worn from 1954 until present. #15 - First Sergeant stripes have been worn from 1968 until present. #16 - Worn since the 1950-s, Service patches have bars representing 2 years of service and stars representing 5 years of service, and are found in many combinations. #17 - This 1st issue Radio shirt patch was only issued one time in 1940 and worn only a few years. A similar patch was worn on coats, but has a black background. #18 - The Dispatcher tab was worn under the regular patch by Dispatchers from the early 1960-s until 1971. Similar tabs of Supv. Dispatcher, Technician I, Technician II, and "Engineer" were worn by those in those positions. #19 - This Radio patch was worn on the left breast area by Dispatchers from the early. 1960-s until 1971, along with the Dispatcher tabs under the regular shoulder patch. This Communications patch has been worn since 1971 and is also found in a larger version that was worn on blazer type jackets in the 1970-s.
#20 - Similar Communications patches with Shift Supervisor, Center Supervisor, and Chief Supervisor are worn. Other positions in the Patrol have patches with titles of Aircraft Operations, Auto Body Technician, Auto Parts, Automotive Technician, Courier, Maintenance, Office Supply, Radio Engineer and Uniform Supply. Some of these patches are also found with Supervisor and Assistant Supervisor tabs at the top. #21 Motor Carrier Enforcement Patch - 2004 - 2008. The former Division of Motor Vehicles Enforcement Section was merged with the State Highway Patrol on January 1, 2003, and renamed the Motor Carrier Enforcement section. This patch was worn by MCE Officers who prior to completing the transition training to Trooper status. Once the training was complete, this patch was retired. 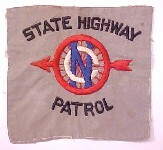 #22 - This is the 1st uniform of the North Carolina State Highway Patrol. 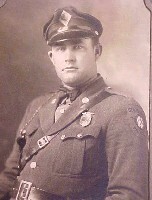 Note the early style visor cap, the bow-tie, and the rounded 1st issue coat patch on the shoulder. Although the uniform has changed since 1929, the proud tradition of service to our state has not.